The SEC announced the kickoff time for the Nov. 7 game against Kentucky. The game will kick at noon EST and will be shown on either ESPN, ESPN2 or the SEC Network. Last season, The Bulldogs beat Kentucky 63-31. Georgia tennis player Caroline Brinson won the USTA/ITA Southeastern singles championship. Brinson beat Miami’s(Fl) Stephanie Wagner 6-7(2), 6-0, 6-4. Brinson defeated teammate Kennedy Shaffer on Sunday to advance to the finals. Georgia was off this weekend but it takes on No. 11 Florida this week in Jacksonville, Florida. Last year, the Bulldogs lost 38-20 and are using that defeat to motivate themselves for this year’s game. 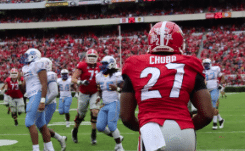 On Friday, Georgia announced tailback Nick Chubb had successful surgery on his left knee. Georgia volleyball lost again on Sunday, this time falling 3-0 to Alabama. Georgia has dropped 20 consecutive sets and is 0-8 in SEC play. Georgia soccer picked up two road victories this weekend against Vanderbilt and No. 16 Auburn. In the Bulldogs win against Auburn, freshman Sydney Shultis scored her first career goal in the 83rd minute to secure a 1-0 victory. This was the first time all season that Auburn lost at home. Georgia baseball completed its Fall World Series, with the Black team sweeping the Red team in all three games. In yesterday’s finale, Senior Heath Holder threw five shoutout innings and junior Skyler Webber hit a three-run home run as the Black squad won 7-0.